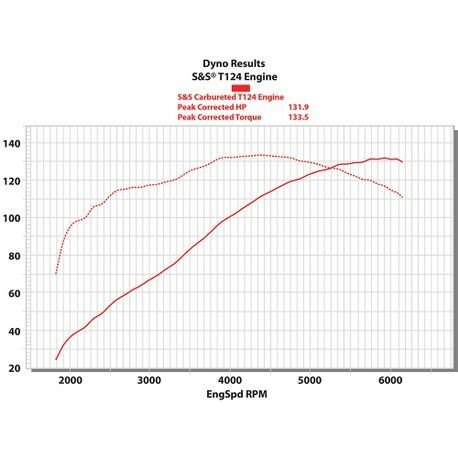 The 124 cubic inch T124 low compression Long Block engine fits 1999-'06 HD big twins except 2006 Dyna models. Long Block engines do not include a fuel or ignition system, so they can be used for either carbureted or EFI applications. If you already have a performance ignition, larger carburetor or a larger throttle body and EFI tuner, they can be used with this engine. The cylinder heads are specially machined to compensate for the longer cylinders so a stock length manifold or throttle body will fit perfectly, and the cylinder head breathers are compatible air cleaners designed for a stock engine. Stock non programable engine management systems should not be used because they are not designed for an engine this large. 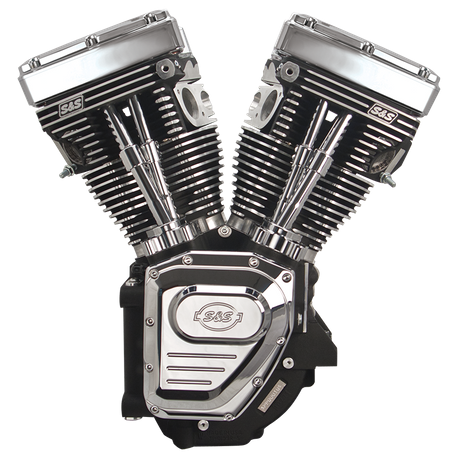 Engine features 4-5/8" stroke X 4-1/8" bore at 10.2:1 compression, S&S 585 gear drive Easy Start cams, S&S TC3 cam plate and oil pump, and black wrinkle powder coat finish that matches stock engine components. This engine has slightly less compression than our high performance T124 engine, making it more tolerent of variations in fuel quality, and a better choice for heavier vehicles. Two year warranty.